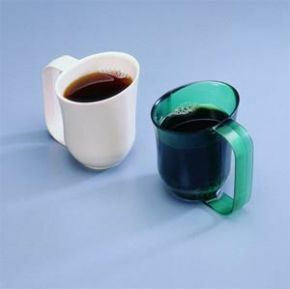 This dysphagia cup helps people with swallowing problems. Drinking while tucking the chin toward the chest gives normal swallowing mechanisms time to work. The design of this cup helps prevent liquids from escaping at the lips and directs the liquid to the centre of the mouth. 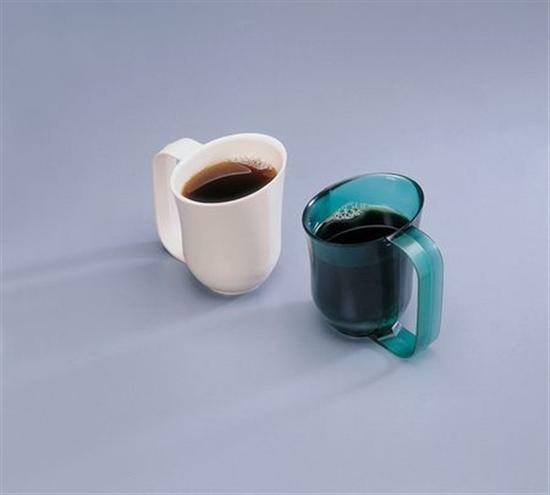 It provides sufficient nose clearance to empty the cup without tilting the head back. The extended handle accommodates gripping by the entire hand or by the thumb only. Dishwasher safe at 80 degrees centigrade. I bought this cup for my aged father who suffers badly from Parkinson's. He has found it a great help and is very pleased with it. Absolutely delighted. My husband manages so much better using these mugs for his drinks.